She wasn’t planning on even going to the party. She wasn’t up for it. She had a daughter. She was a single mom. She didn’t have time for a party. But she went and she met him. They were both divorced and in their mid-thirties. I don’t know if they were looking for love. He was a surgeon, quite the busy little bee. She was a school teacher with a pre-teen daughter. They both had lives that depended on them. But love didn’t care about any of that. A year to the day after that party, they wed in a small ceremony. They loved each other eternally but I bet they were both scared. They’d played this game before and lost. Would they make it? They lived in a small house close to the hospital. He took her daughter in as his own. He worked long hours but always made time for them. They were happy. She was pregnant within the year. Once again, she was scared. She was over 35; a smoker. Her pregnancy had risks but they wanted another child. Nine months later, a healthy, baby girl was born. She chose to stay home with their girls and left the teacher’s life behind. A year after that, they moved into their dream home. The fears they’d once had crumbled behind them as they burst forth into their new lives. They were a family; a family they’d both always wanted but never thought they’d have. The years passed and their children grew. Eight years after they married, their oldest daughter went off to college. He worried about the time he’d missed with her. He was always at the hospital. He made it home for dinner as much as possible but he missed birthdays and holidays. He wanted more time. He retired at 47 and spent the following years watching his baby girl grow. He attended every soccer game and dance recital. They went on family vacations and didn’t have to worry about on-call scheduling. Life was perfect. Their baby girl soon grew up before their eyes. She ran off to college with a kiss and a wave and never looked back. They were once again alone; just the two of them. You’d think they’d be lonely, missing their children who had shared their home for eighteen years. You’d be wrong. Well, of course they missed their girls, but their absence opened up a lifetime of opportunities for them to create new memories together. For the next ten years, they did just that. While it may have taken a while for them to find each other, once they met, the rest was history. Happy Anniversary Mom & Dad – Here’s to 30 more! Sorry for the cheese factor but I’m so happy for them! Awesomeness Awaits at Yeah Write! Not cheesy…This is awesome. Happy Anniversary to them. What a beautiful story, Meg. Me – sorry, should have used a full stop…instead of a comma. But then I can’t edit my comments once I’ve hit send. Haha – I figured 🙂 But wanted to make sure! yup – definitely me!! The story was incredible and so well written. Thanks for sharing it! Very nice! Congrats to them! Awe wow that is so lovely and congrats to your parents. now I am going to ask a cheeky little question but how do you get that cartoon character of yourself, I have seen someone else with one of these too and would really love one myself 🙂 Your blog isl ooking lovely did you change it recently? Thank you! I got the cartoon character through yeah write since I’m a contributor and all of them have one (that’s probably where you’ve seen it!). I don’t know if you subscribe to them, but they are actually doing a giveaway of one for their birthday! Sign up if you can! oh gosh thank you. I am not sure if the other person contributes, i must look. I looked up yeah write there were a couple is this the address? I think that’s affiliated with yeah write but the website should be http://yeahwrite.me. You should be able to click the badge in my post and it will take you there (I think!). I am currently doing their interview series which posts the fourth Monday of each month and I handle some of the Speakeasy’s social media. That’s the fiction side of things over at yeah write. It’s a great community. I highly recommend checking them out and please let me know if you have any questions! 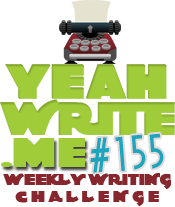 This is a great time to jump in as yeah write is turning 3 and we are in party mode! Hah it looks great, I went to the link you sent me, it seems a great idea and wonderful that one can get some feedback too. The people there are awesome. There are 3 challenges so things can get pretty hectic. Feel free to ask if you have any questions or need help navigating the site! In the alternative, I found the website where you can buy one! Very sweet. A loving tribute to your parent’s life together. Good stuff, Arden. And way to make me feel like a shmuck for never doing anything for my parents on their anniversary! Hey, it’s the thought that counts… so, no, that doesn’t make me feel better. My mom used to tell my brother and me all about the 25th wedding anniversary she and her brother through for their parents… and she was disappointed that we didn’t take the hint and do something nice for them on their 25th… Whoops. Oh well. There’s always the 50th… that’s less than 15 years away at this point. Maybe we can redeem ourselves. Haha – Exactly! I’ve never thought of doing something big like a party (also whoops). I got 20 years until they’re 50th. Plenty of time to plan, right? Plenty. Too much actually. You should probably hold off on starting to plan for at least 19 years or so…. This was SO not cheesy. It was a lovely tribute. Happy Anniversary! Very sweet, and Happy Anniversary to your parents. Oh, and who doesn’t love cheese? Yay! It’s great that there actually is a happily ever after for some people. I thought this was going a fiction route even though it wasn’t in the speakeasy section. I love that it’s celebrating your parents’ anniversary! Here’s to them!! So you are the younger daughter, no? I loved this. We have one at college and two at home. It does go by quickly and I’m not wishing it away but the freedom of just the two of us will be lovely. Happy Anniversary to your mom and dad. I am the baby girl 🙂 Thanks for reading! What a lovely story! Happy anniversary to your parents! I’m so happy this piece was non-fiction! Awww… This totally gave me the warm fuzzies! I’ll take a love story like this over “Twilight” or Nicholas Sparks any day of the week! If practice makes perfect, how would anyone be expected to get married right the first time?! Congrats to your parents and to you, baby girl! I know you’re too young to be the eldest. Very sweet story! I love the pace and it’s so well written.